If there’s one central theme emerging from an International Forum on Malaysia in Kota Kinabalu the Sabah capital on Saturday (Oct 5), it was that Sabah and Sarawak’s 50 years in Malaysia – 1963 to 2013 – has been plagued by more than its fair share of bad politics. The gathering ‘International Forum 2013 Malaysia 50 Years On . . . Expectation Vs Reality’ sponsored by the prestigious Borneo Heritage Foundation (BHF), saw the day-long presentation of 11 papers by a distinguished gathering from around the world before a packed ballroom. These included academicians and lawyers from Australia, Singapore, Penang, Kangar, Kuala Lumpur, Kuching and Kota Kinabalu. There were two sub papers – contributed, not presented – from Sabah and the United Kingdom, the keynote address by organising chairman Paul Voon and closing remarks by moderator Simon Sipaun, a former Sabah state secretary. Simon is the immediate past vice chairman of Suhakam, the Malaysian human rights organisation and an advisor to the Malaysian Anti-Corruption Commission (MACC). Voon is the former managing director of the Borneo Mail. One sub paper, ‘Seizing the Moral High ground on Sabah, Sarawak Federation with Malaya: Charting the Way Forward from Poverty to promise as Borneo activists put Putrajaya on edge’, presented by this writer, focused on various issues on Sabah and Sarawak rights being kept alive in the alternative media and social media. The main idea being floated is by the “we want to stand on our own two feet” lobby. Others include the call since the late 1980s by BHF chairman Dr Jeffrey Kitingan (left) for the Malaysian government to comply with the 1963 Malaysia Agreement (MA63), Simon’s mantra that “life in Sabah was better before Malaysia”, the movement to restore the sovereignty of Sabah and Sarawak of 31 Aug, 1963 and 22 July, 1963 respectively; the Sarawak’s government’s decision this year to observe 22 July as Liberation Day for the first time in 50 years; the UK-based Borneo’s Plight in Malaysia Foundation (BOPIM) internationalizing “the colonisation of Sabah and Sarawak by Malaya”; ongoing efforts to wrest back control of local oil and gas reserves from Putrajaya, and the push to carry out the never implemented 1973 Review of the status of Sabah and Sarawak in Malaysia. In Sabah, the federal government stands accused of embarking on “the virtual theft of an entire country from its people in cahoots with illegal immigrants” who are allegedly being entered in the electoral rolls. Other running themes in the alternative media, Facebook in particular and/or by email, are that Malaysia is a failure – lack of security, poverty, unflattering comparisons with Singapore (its economy being almost as large as that of Malaysia) and Brunei are being cited –; Sept 16 is Occupation Day since there was “no Referendum” on Malaysia; Malaysia is a bad British idea; the Sabah Royal Commission of Inquiry (RCI) on illegal immigrants was set up to be a great whitewash; and the UN should revisit Malaysia in Borneo following allegations of colonisation. The other sub paper, ‘Malaysia: the Making of a Grand Design’, by Professor A. J. Stockwell, was based on declassified colonial documents on Malaysia released in London. Apparently, these documents appear to indicate that the British were convinced that “Malaya would colonise Sabah and Sarawak after they left”. Jeffrey Kitingan sketched three options in conjunction with the 50th year of Malaysia in Sabah and Sarawak: (1) tolerate the present situation i.e. do nothing; (2) get out (of Malaysia); or (3) Review the status of Sabah and Sarawak in Malaysia – in his paper, ‘Malaysia at a crossroad’. He disclosed that former Prime Minister Mahathir Mohamad advised him once not to make the people “smart”, “don’t tell them what they do not know”. That was before Jeffrey was detained without trial under the draconian Internal Security Act (ISA) for three years. Mahathir “had heard that Jeffrey was "instigating the people in Sabah”. Professor Dr. Kevin Tan from Singapore reviewed the city state’s brief two-year membership (1963 to 1965) in the Malaysian Federation. His Paper, ‘Federating for Survival: The Case of Singapore’, left no doubt that Singapore’s merger with Malaya via Malaysia was more about saving then Prime Minister Lee Kuan Yew from certain defeat at the hands of the communists! Sabah and Sarawak were the sacrificial lambs to Malaya to save Lee’s political career. Lawyer Sukumaran Vanugopal from the Sabah Law Association (SLA) gave several instances of the Malaysian government being in breach of MA63 in his paper, ‘Malaysian Constitution: Whether in Accordance with the Malaysia Agreement 1963’. It appears that such breaches could have been avoided by taking the necessary legislative, executive and other steps stated in the Inter Governmental Committee (IGC) Report to give flesh to the assurances, undertakings and recommendations in MA63. However, because of the absence of a basic features doctrine in the Constitution, Sabah and Sarawak rights in Malaysia were whittled away over the years. Left unsaid was that the constitutional documents on Malaysia render such whittling away null and void to the extent of their inconsistency with the uncodified Constitution of Malaysia. The most infamous example of whittling away was a 1973 state constitutional amendment making Islam the official religion of Sabah. Sukumaran, however, did not point out that the amendment was undertaken by the illegitimate Mustapha government, returned to power unopposed when opposition candidates were forcibly prevented from turning up to file their nomination papers. Another infamous doing away was the 34 per cent veto power representation in Parliament for Sabah and Sarawak. Veto power would prevent any amendment to the Federal Constitution unless Sabah and Sarawak consented. Lawyer Lee Heng Seng left no doubt in his presentation, ‘Constitution, Religion and Freedom’, that constant attempts were being made by various Umno agenda parties to subvert the secular nature of the constitution. He maintained that Articles 3(1) and 3(4), read together, underlined in no uncertain terms the secular nature of the Malaysian constitution and nation state and its commitment to the rule of law and a common nationality. The federal government, pointed out Lee, had no business meddling in Islam which was a matter for the Malay sultanates to handle, and the Syariah Court – being an inferior Court –could not encroach into the jurisdiction of the civil court. He warned against the federal government practising a form of warped logic all on its own and going out on a limb to ensure that any law in Malaysia was Syariah-compliant. Such so-called compliance was unconstitutional, thereby unlawful and therefore illegal. 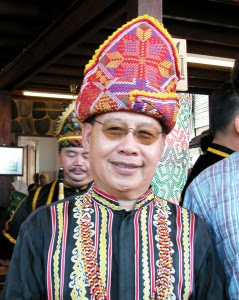 Universiti Malaysia Sarawak (Unimas) senior lecturer Dr Arnold Puyok, born of a Filipino father and an Orang Asal mother, injected a note of candour into the forum when he disclosed amidst pin drop silence that his family on the paternal side was beneficiaries of the infamous Projek IC undertaken by Putrajaya in Sabah. His father had to make do with a red IC, denoting permanent residence, all his life because he was not willing to sacrifice “his principles”. An uncle however received the blue IC, for citizens, because apparently he had no qualms in abandoning his “principles”. His paper, ‘The Security of Sabah and the Philippines Claim’, warned of the systemic threats in Sabah with particular reference to the issuance of Malaysian documents to illegal immigrants by the backdoor. The threats to Sabah, reiterated Puyok, were internal in dismissing the so-called Philippines claim to Sabah. Former Sabah Chief Minister Yong Teck Lee, assisted by lawyers Peter Marajin and Ken Yong, spoke on ‘Promise of Borneonisation of the Federal Public Service in the Borneo States’. Yong vowed that he would pursue the issue of Borneonisation all the way to the United Kingdom, the International Court of Justice (ICJ) and the United Nations. Borneonisation, pointed out Yong, was an integral part of the assurances, undertakings and recommendations pledged in the IGC report. Ken Yong stressed three pertinent points in adding to Yong’s remarks: (1) Putrajaya knows all about the grievances of Sabah and Sarawak but has no intentions whatsoever of doing anything to address them; (2) they will fight Sabah and Sarawak all the way to maintain the status quo; and (3) that Sabah and Sarawak (governments) were not doing anything to take up these grievances. Dr. Wong Chin Huat (left) of the Penang Institute, a think tank, spoke on ‘Double Decentralization: The Case for Regional & Divisional Governments with Substantial Devolved Powers in Sabah & Sarawak’. Wong cautioned Sabahans and Sarawakians against blaming the Malayans for everything in pointing out that the greatest threat to them came from their own local elite. He warned that independence for Sabah and Sarawak would be like going from the proverbial frying pan into the fire if these local elite are not dealt with and put in their proper places. He recommended that the people in Sabah and Sarawak work towards weakening Putrajaya and getting more power for their ‘nations’. He cited India as an example of devolution and decentralization. Malaysia, said Wong, is mistakenly a one size fits all and described this approach as a curse for Sabah and Sarawak. Keeping in mind the desire in Sabah and Sarawak to be free of Malaya, Professor Andrew Mitchell from Australia spoke on ‘Self-determination’, with specific reference to Quebec and Chechnya. It’s unfortunate that he made no mention of other examples especially South Sudan which won independence from Sudan after the UN concluded that it (the south) was being subjected to internal colonisation by Khartoum. His presentation has to be read together with the finding of the jury, still out, on whether Malaysia was properly set up in Sabah and Sarawak. Sabah DAP leader and Kepayan state assemblyman Dr Edwin Bosi reminded the gathering that the non-Muslim natives in Sabah continued to be the big losers with their nation’s continued membership in the federation with Malaya. In his Paper, ‘50 Years in Malaysia – the non-Muslim Natives are Big Losers’, Edwin lamented that the Orang Asal population had declined from 42 per cent in 1911 to 18 per cent today and keeps dropping. He went through a list of other indicators – politics, civil service, education, wealth, Native Court, Native Land (NCR) – to illustrate the tragedy of a Nation of Tribes in decline. Associate Professor Murray Hunter from the Universiti Malaysia Perlis urged in his paper, ‘Community Empowerment – Developing Democracy’, to focus on a bottom-up approach which does away with the dependency syndrome. Murray has practical experience in the field in Sabah, Sarawak and Thailand, among other places. Unimas Professor Dr Dimbab Ngidang in the final Paper, ‘Personal Observations of Sarawak Experience 50 years in Malaysia from the Window of a Homeless Mind’, stressed that remaining silent was no longer an option for the natives in Sarawak. He disclosed that the Dayak communities will gather in Kapit, Sarawak, soon to deliberate on a way forward after 50 years in Malaysia. The main theme will be on the burning native land issue in Sarawak in the light of various recent court decisions which gives no economic value to their ancestral lands. The Dayaks want the right to get titles to their land and the further right to enter into sales-and-purchase agreements to transfer these properties to any other native or lease them to non-Natives for a consideration or enter into joint ventures for commercial purposes. It’s not enough to just look at only constitutional, legal and brief historical aspects in reviewing 50 years of Sabah and Sarawak in Malaysia or vice versa. We will have to consider the political and fuller historical aspects – politicization and the ballot box; the court of public opinion, appropriate unilateral government policies (administrative laws) to accommodate expectations on assurances, undertakings and recommendations, amendments to the constitution to ensure full compliance on MA63 and other constitutional documents on Malaysia. The ball is in the Government's court to do something – it may already be too little too late – before Sabah and Sarawak reach the point of no return. There were several questions from the floor but not enough time to answer all of them. A 12-year-old boy from Pitas, the poorest place in Malaysia according to him (actually Nabawan), expressed a wish for the future: do something. One Sikh gentleman told me that no one on the panel of speakers actually answered his questions. Accepting the status quo is a ‘No, No’ as Simon made it clear in his closing remarks. Briefly, he pointed out that people in Sabah and Sarawak were not happy (with Malaysia). The reading is that something must be done. I remember reading Jeffrey somewhere: "We can't sit around doing nothing and expect some nice things to happen to us some day." Dimbab had something when he said something to the following effect: "If you keep quiet, the government will assume that you are happy. Why give anything to people if they are not complaining?" Tolerating the present situation in Sabah and Sarawak is only possible if people don't know that they should be unhappy. It was disappointing that both Prime Minister Najib Razak and Hindraf Makkal Sakthi chairman and Deputy Minister in the Prime Minister’s Department P. Waythamoorthy were not invited as initially agreed by BHF. Opposition leader Anwar Ibrahim had been expected to do the closing and Najib the opening. Both the government and the opposition, in conjunction with the 50th year of Malaysia, should take a public position on the issue of Sabah, Sarawak rights. Former Sabah Chief Minister Harris Salleh, sometimes the self-appointed spokesman for the federal government, had said a few days ago that he would be watching the BHF Forum very carefully. No doubt he will have something to say soon on the forum. If the federal government doesn't distance itself in time from the frequent statements by Harris promoting rule “by” law in the media, everyone will assume they reflect the official position. Why doesn't Taib Mahmud in Sarawak parrot the line taken by Harris? The Sarawak CM knows it will not be popular with the people.